Although not as good as the original, Men in Black 3 is by far superior to the second movie in the science-fiction franchise, and this Blu-ray is a welcome addition to any library. For the third film, Tommy Lee Jones’ (Captain America: The First Avenger) Agent K is the target of the evil alien Boris the Animal (Jemaine Clement, Despicable Me). 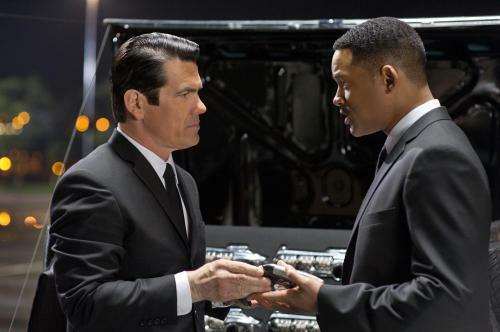 When Boris goes into the past and kills K, Will Smith’s (I Am Legend) Agent J must follow and stop it, all the while finding ways to get along with the younger K (Josh Brolin, True Grit). Written by franchise newcomer Etan Cohen (Madagascar 3: Europe’s Most Wanted), Men in Black 3 has some fun with the movie’s world, giving us a look at the Men in Black of 1969. Flower people, Andy Warhol and the launch of the moon landing are all part of the story. Smith is as good as usual as the fast-talking Agent J, but the standout performance goes to Brolin, who does a great version of deadpan Jones. It’s fun to see Emma Thompson (Brave) in the movie, although her role isn’t as good a showcase of her talents as others, and Alice Eve (The Raven) as the younger verson of Thompson. Michael Stuhlbarg is wonderful as the innocent Griffin, much different from his Arnold Rothstein character in TV’s Boardwalk Empire, Clement is disgustingly good as Boris, and Bill Hader (Paul) is hilarious as Warhol. Franchise director Barry Sonnenfeld (Get Shorty) keeps the action high, from Smith jumping off the Chrysler Building, to a lunar prison break, battles with aliens and more. The visual effects and sets are superb, and all look fabulous in Blu-ray’s high-definition. We get to see all the horrific details of the weasel and other aliens, as well as the fun 1960s details in the past scenes. The 5.1 DTS-HD sound is all fine too, giving us good squelches, tire squeals and, of course, that iconic MIB soundtrack. The Blu-ray/DVD Combo is packed with extras, and the behind-the-scenes pieces are entertaining as well as informative. The fun starts with “Partners in Time: The Making of MIB3,” which features interviews with director Sonnenfeld, writer Cohen, and a bunch of the actors. Smith and Jones are happy to be back in the black suits, and Brolin tells us about how much he enjoyed being on the set. But the most interesting parts are when we get to see the making of the aliens with creature guru Rick Baker, who received his own star on the Hollywood Walk of Fame the same day this disc was released, discussing how he created the creatures. Baker says he designed more aliens for this movie than for the other two films combined. Baker and other designs go into detail about the inspirations for the individual aliens and especially the incredibly creepy Boris. Behind-the-scenes continues with “The Evolution of Cool: MIB 1960s vs. Today,” looking at the art design for the older Men in Black movies and the MIB office and gadgets back in 1969, including the fun monocycle. The movie’s awesome visual effects aren’t explored in “Partners in Time” but get their own featurette with “Keeping It Surreal: The Visual FX of MIB3.” The piece is coupled with Scene Investigations and Progression Reels that go into the extensive blue-screen work used in the movie, how the aliens were interpreted digitally (Baker was instrumental with that part too) as well as the set work, for example to turn Long Island into Cape Canaveral. The Scene Investigations show details about the visual effects for the Lunar Prison Escape, the Showdown at Mr. Wu’s, J’s Time Jump and the Monocyle Chase, and they’re perhaps the most interesting extras on the disc. The Blu-ray also has a short but funny gag reel, the music video for “Back in Time” by Pitbull and a “Spot the Alien Game,” in which you shoot aliens at Mr. Wu’s. The action is a little slow using a remote, but youngsters will enjoy the game and winning medals at the end. I wouldn’t say MIB 3 beats the first movie either, but it certainly gives it a run for its money, lol. The guys in my office at DISH kept trying to tell me it was awesome and I am happy I finally listened. And I have not seen Brolin before, but he really stole the show. Our whole house was filled with laughter the entire evening.